1. They have a lot of sheep. 2. They are not Australians. 3. 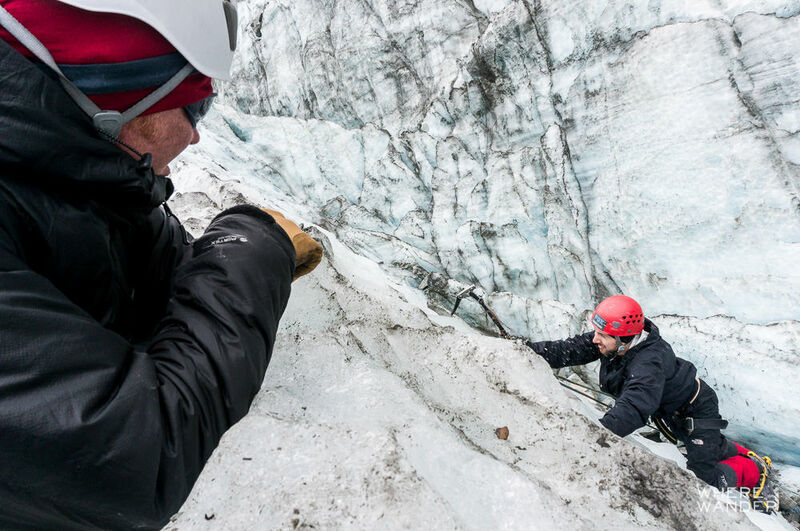 They have glaciers you can ice climb on. 1. I was going to eat a lot of lamb. 2. I wouldn’t have to hear “G’Day Mate” every morning. 3. 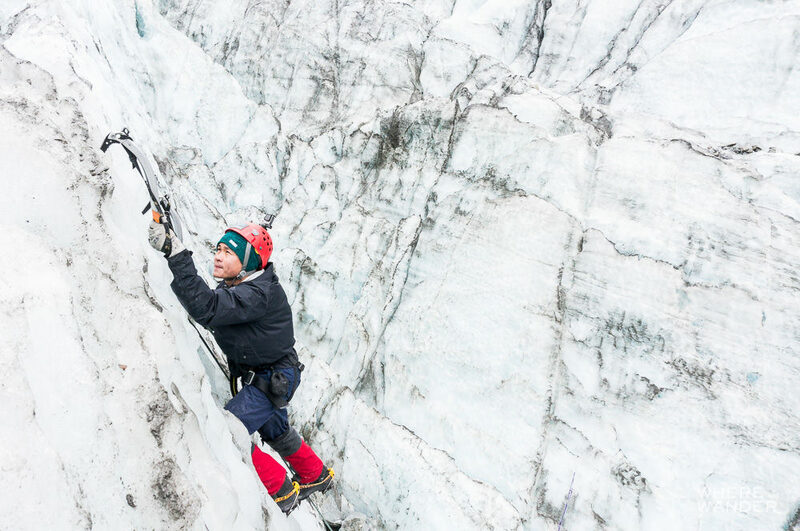 I can ice climb a GLACIER! As in, someone would hand me a couple of ice axes and I can climb straight up a glacial ice wall like in Game of Thrones. Just without Jon Snow’s beard. Naturally, this went right to the top of my list of things to do in New Zealand right after “running through a field of sheep”. 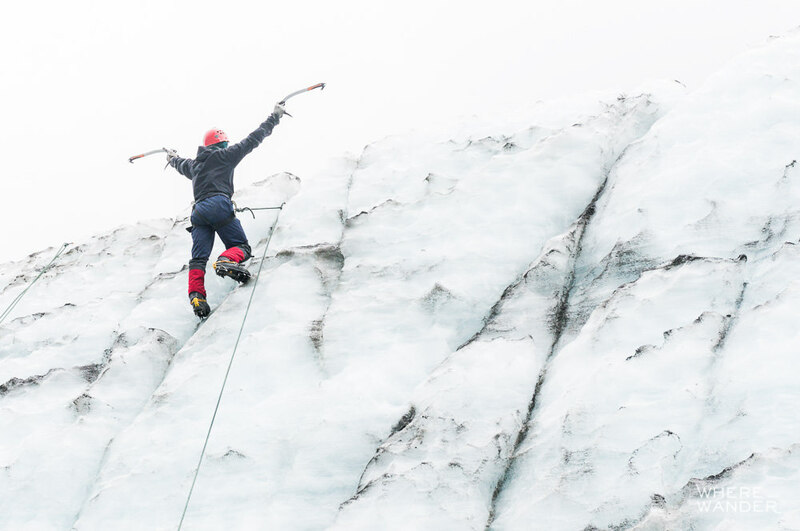 Ice climbing is almost exactly what it sounds like. 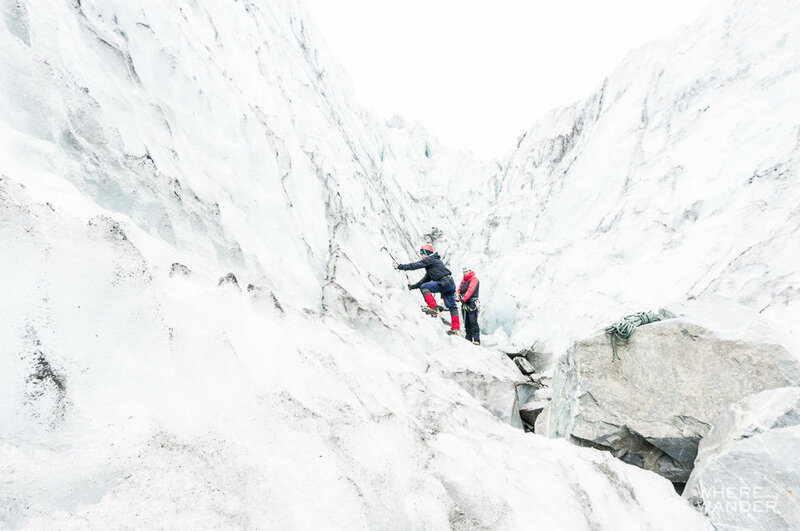 Much like rock climbing refers to the art of scaling up a rock wall, ice climbing refers to the practice of scaling up an ice wall. These walls are usually in the form of icefalls, frozen waterfalls, and rock walls covered in ice that has formed from frozen water flows. 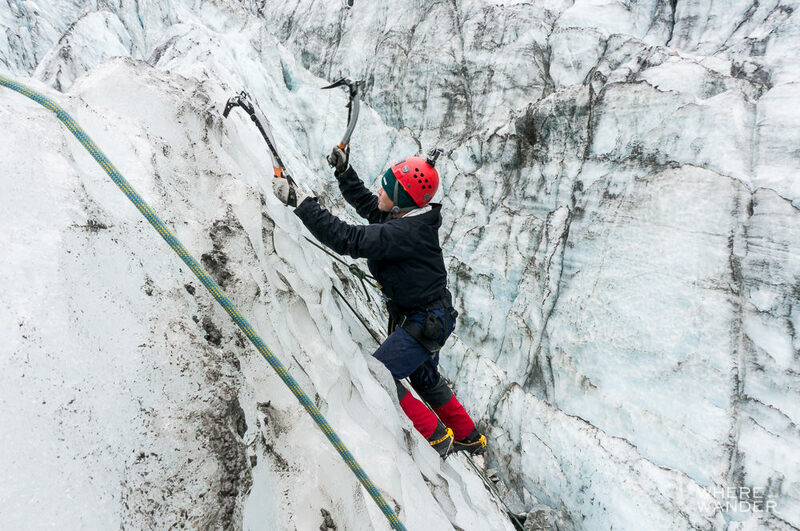 Since ice is pretty cold and can be slippery, jagged and even brittle, climbers don’t actually make direct hand contact with the ice. 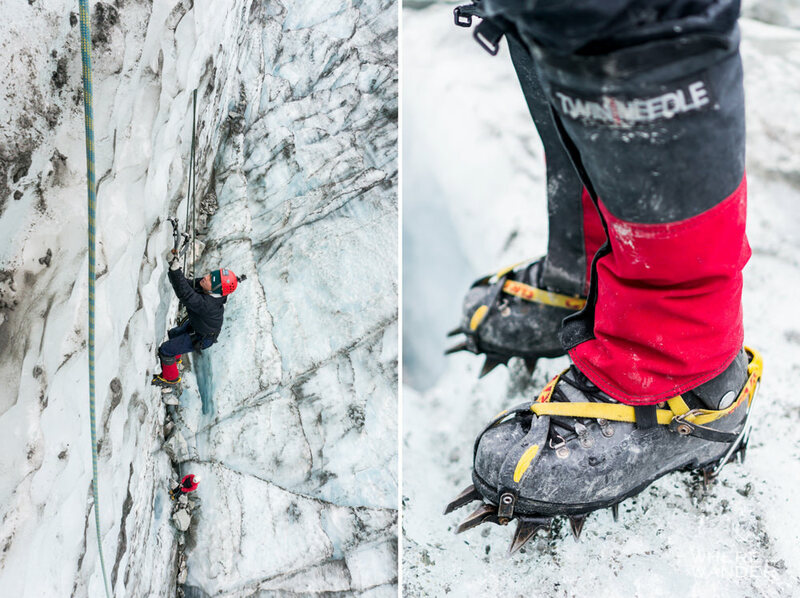 Instead they use a pair of ice axes that they impact into the ice and crampons (basically spikes for the bottom and front of your shoes) over their boots that they kick into the ice for grip. 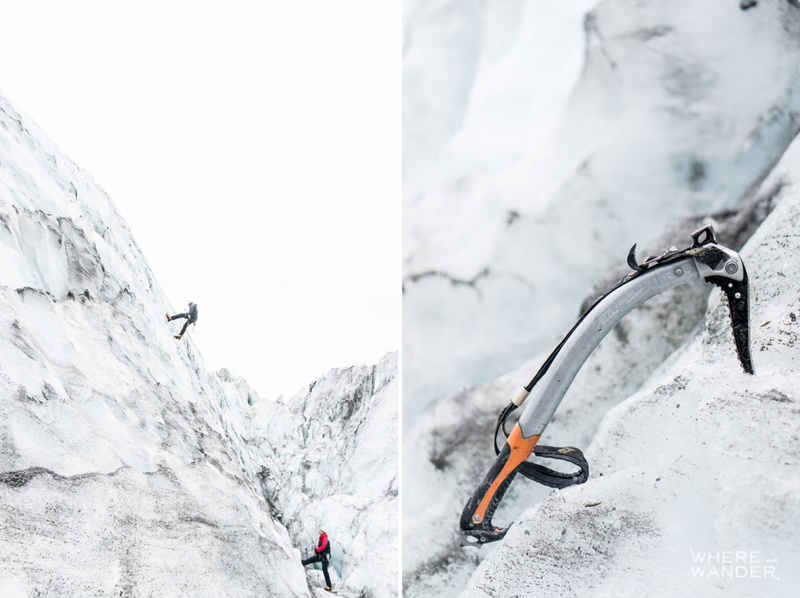 With the combination of these two tools, climbers are able to traverse up and across the face of an ice wall. 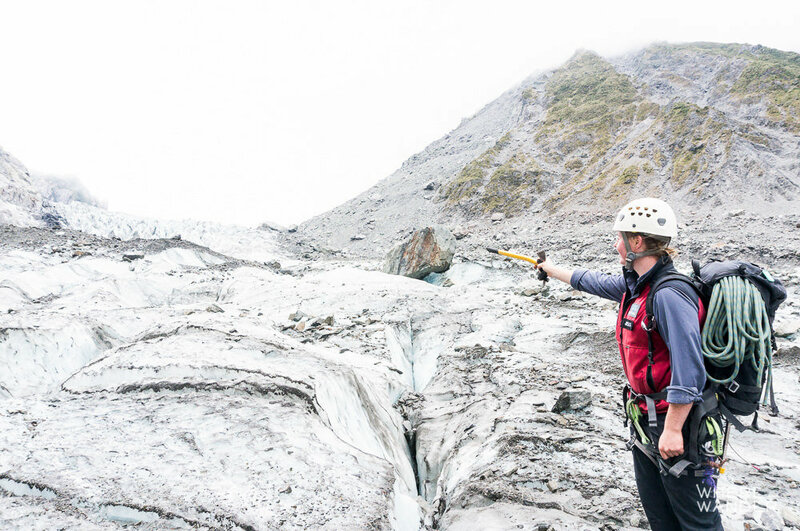 Our camper van route had taken us from Christchurch down to Invergcargill and then wrapped back up to Milford Sound and Queenstown, where we stopped for our obligatory extreme activities and a Fergberger. 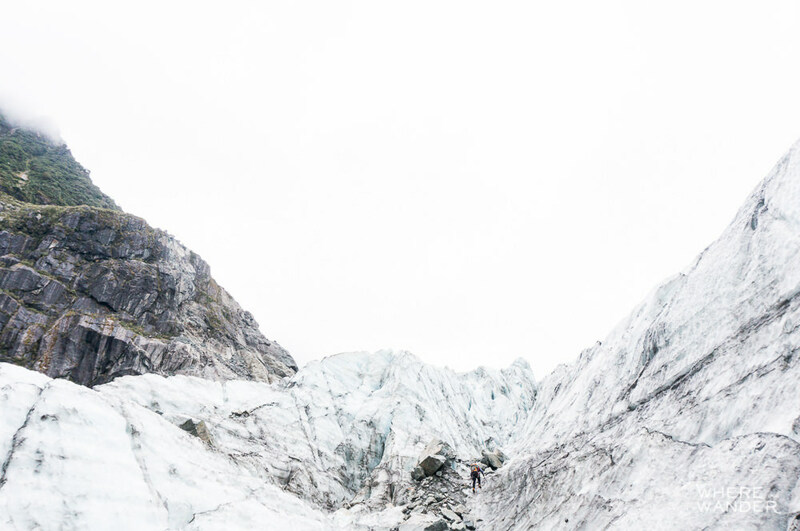 After I had reached out to Fox Glacier to arrange for a guided day of climbing, I was eagerly counting down every day until we got to the quaint little town where they operated from. I didn’t complain though. I passed the time canyon swinging down a ramp on a tricycle, jumping off waterfalls, and eating a lot of lamb (and one possum pie). 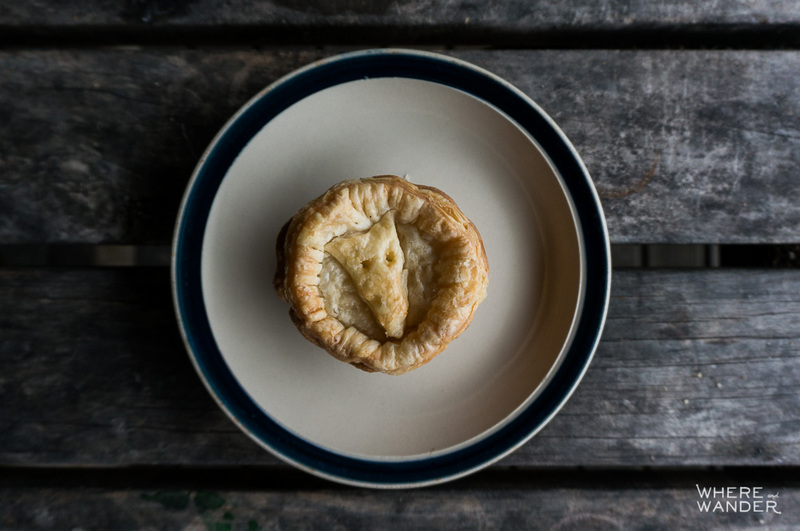 Special Tip: If you want try a possum pie, check out Pete’s Possum Pie. 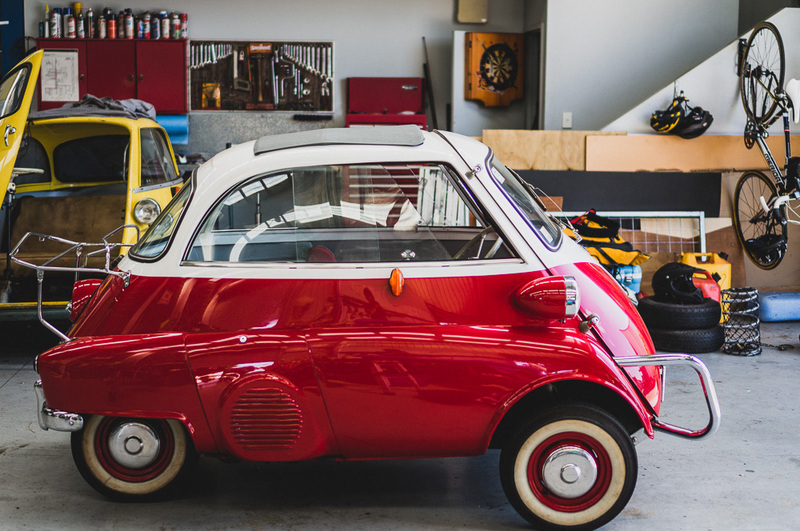 Last I heard, they weren’t being allowed to sell it, so check out their website to see how you can still “buy” one. 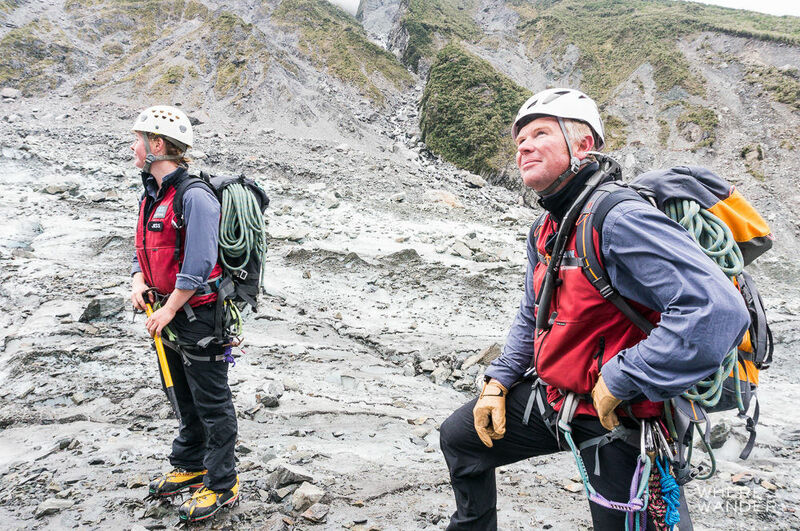 On the morning of the climb, We were warmly greeted by Marius and Jess at their office and suited up for the hike in and climb. Marius is the guiding manager at Fox Glacier Guiding and has been in the business for a long time, so I knew we were in good hands. Tess (at the time) was a trainee, but I’m jump ahead and say that her knowledge, skills and interactions with us would never have betrayed that bit of information. 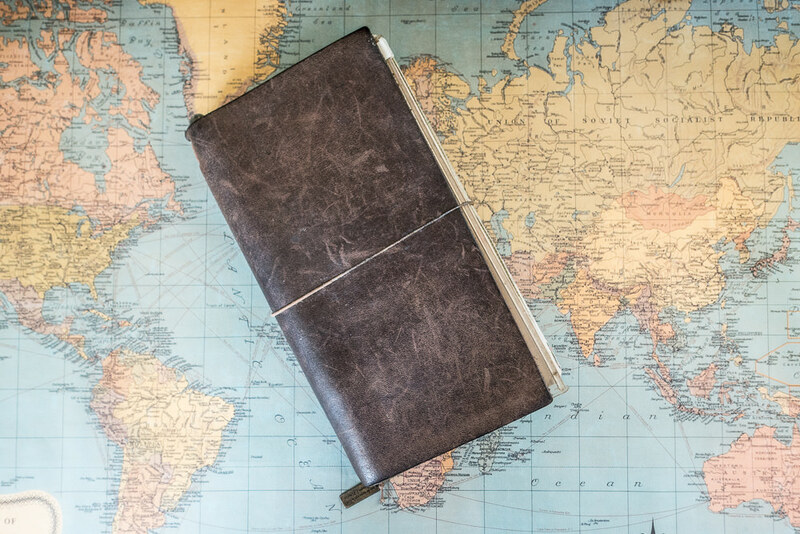 I came relatively prepared with a pair of long johns and thermals, but they also provide everything you would need if you happened to show up in shorts and a tank top. 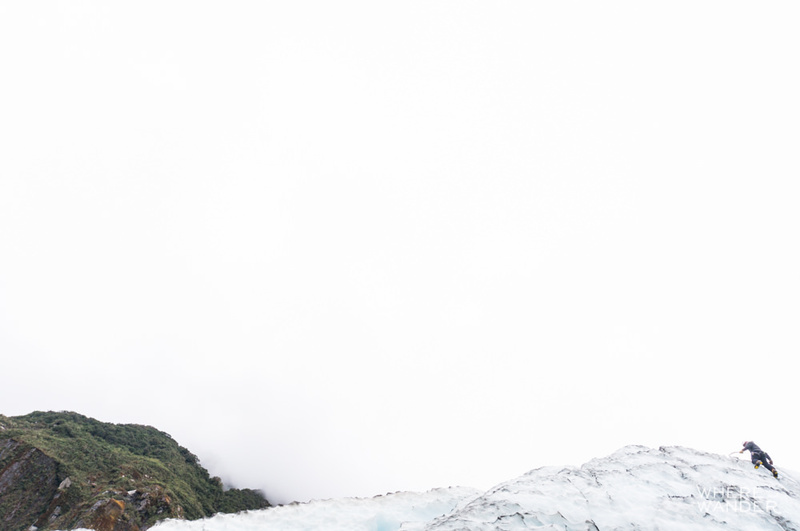 That said, don’t show up to climb a GLACIER in shorts and a tank top. After packing up our equipment, we hopped on a bus to get to the trailhead and began the 45 minute hike in. 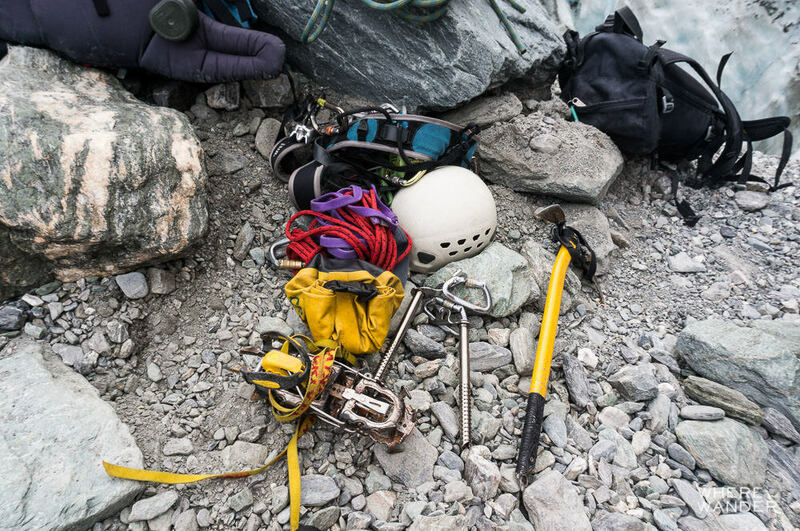 Our gear bag, had everything we needed for the climb: a pair of ice axes, crampons, ropes, carabiners, belay device, ice screws, and a helmet. I think the last one is to protect you in case a bird poops on your head while you’re climbing. I was surprised at how quickly we would see the actual ice wall. 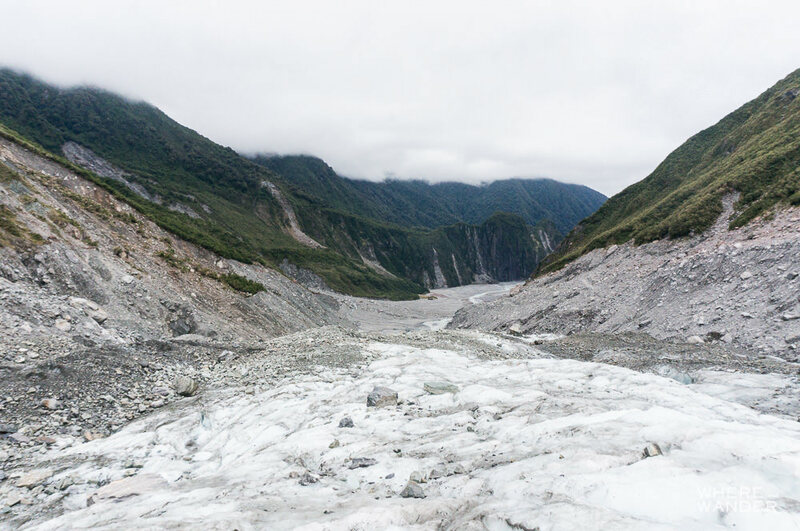 Within 15 minutes, the rocky terrain completely changed and we could see the marbled glacier looming in the distance flanked by gray granite and green hills on both sides. 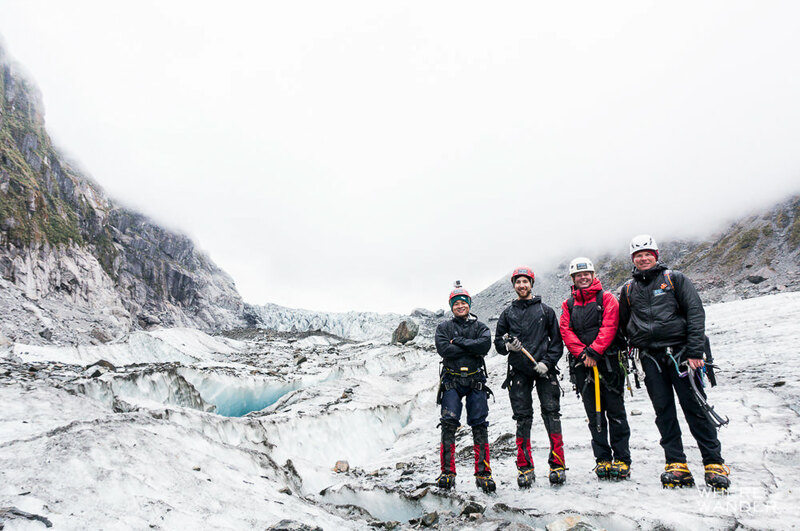 With our crampons on, we were able to walk confidently on the crunchy ice and rock composite and navigate around small crevasses. 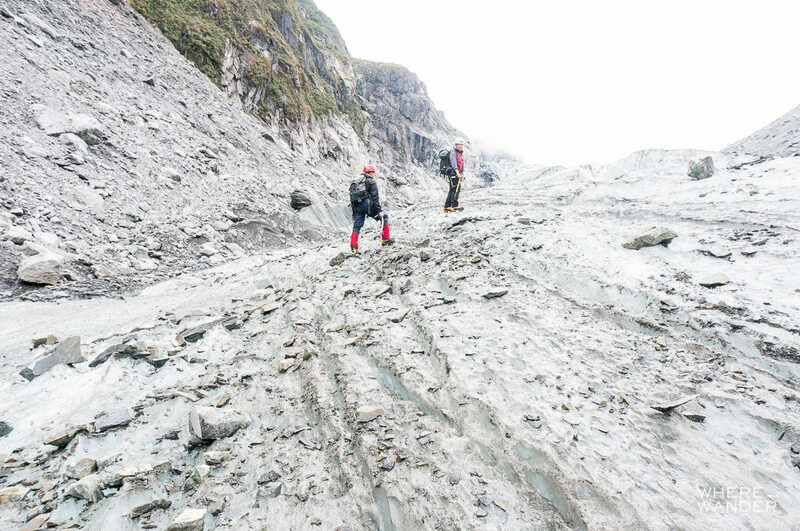 Along the way, we passed a group of people on the Glacier Walk tour, and I felt pretty damn cool thinking that they would ONLY be walking on this glacier. 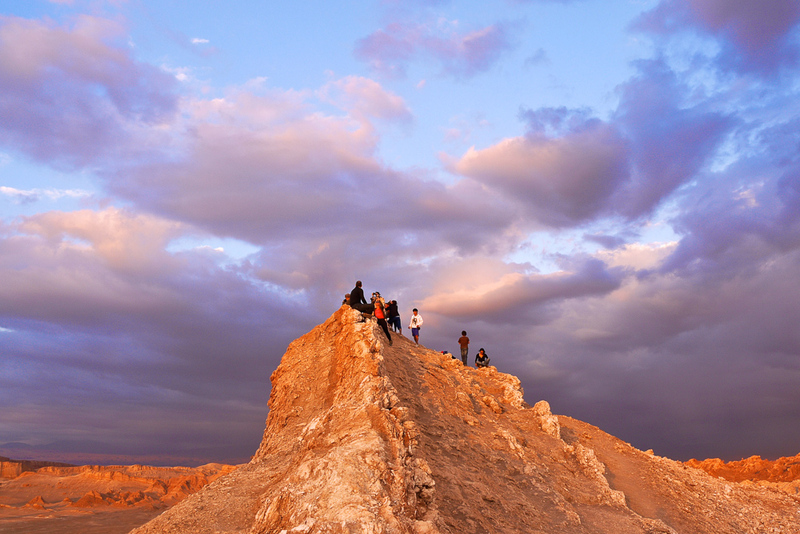 We would be climbing it. Boom! If getting an ego boost is a ever a reason to do something, I think this is a pretty good excuse. Marius smiled, and then walked off up the back side of the wall to place in the ice screws that would be the anchor for our rope. The way he surely and solidly walked up the ice made it seem deceptively easy. It was not. 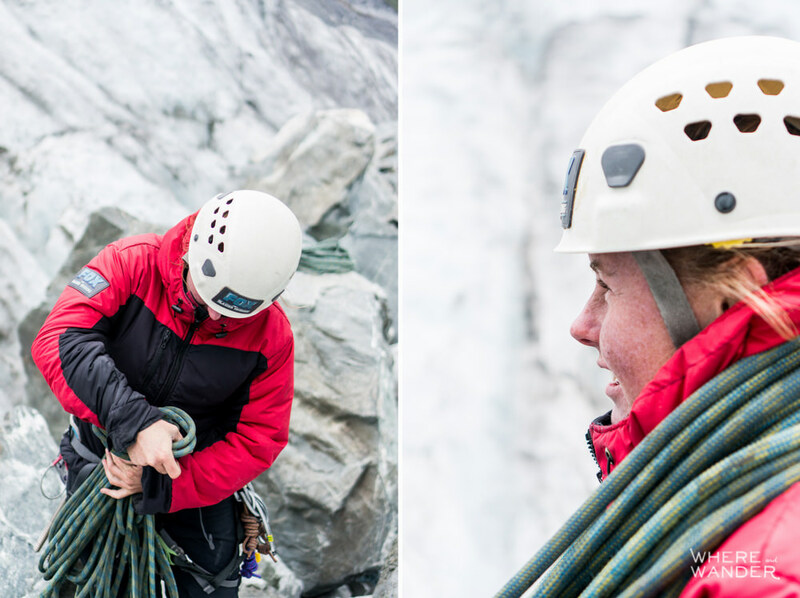 Using a less vertical part of the opposite wall, Tess taught us the basics of ice climbing. Kick. Kick. One foot on the wall. Kick. Kick. Other foot on the wall. Flick. Flick. Ice axe one in. Flick. Flick. Ice axe two in. Breathe. Repeat upwards. 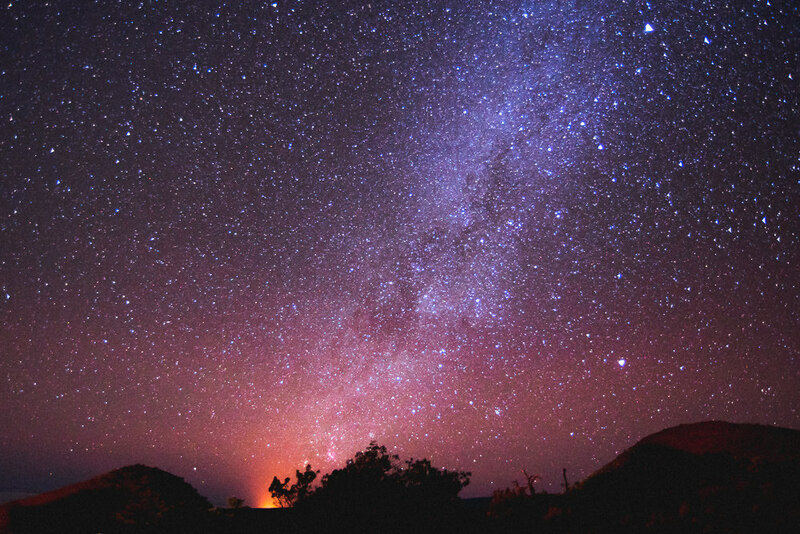 I tied in, did a safety check with Tess, looked up at Marius, who was waiting at the top with a smile, and began. Following Tess’ instructions, I started ascending with surprising ease. 15 feet up in no time. Not too bad. Kick. Kick. One foot in. Kick. Kick. Other foot in. Flick. Fl–. “Sh****t!! !”, probably echoed across the valley, just as my left boot slipped off the wall along with a broken piece of ice. 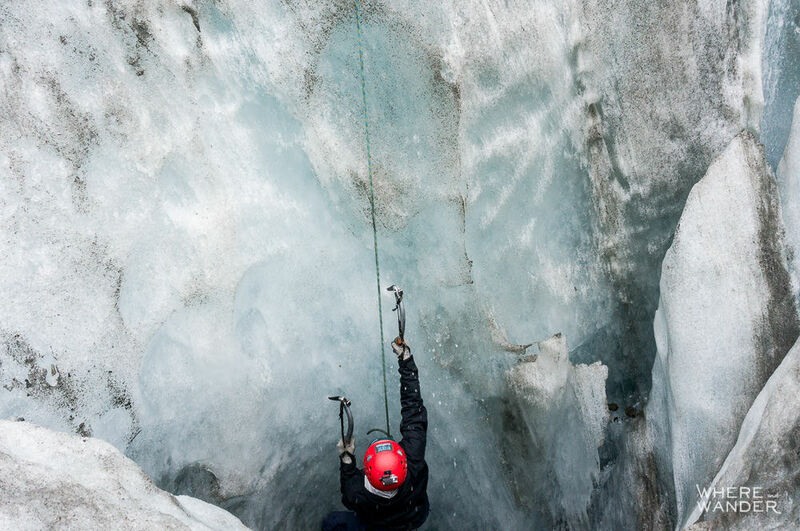 Although it was disarming, I was still pretty on the wall hanging by one crampon and both axes. Note to self: kick harder and deeper into the ice. Climbing Tip: It’s all in the legs. You will pump out your arms if you try to reach too high and pull yourself up. Instead use your arms and axes to balance yourself and “walk” up the wall a couple of small steps at a time. I took a deep breath and continued. And up I went, right boot, left boot, right axe, left axe. Each set of four moves shifted me up the wall by about a foot each time. But I was bit more apprehensive now, wondering with each step whether the crampon will hold until I could make my next move. Halfway up, I had to loosen my grip and relax my forearm as I started to get the pumped feeling when you overuse your muscle. Drawing from my climbing experience, I started to put more focus on my legs and remembered not to overextend and try to pull myself up. Instead I would take multiple small steps and use the axes to balance and keep myself affixed to the wall. Exactly like I was instructed to do so. This made the second half easier (not easy) and eventually I got to the top. I swung over, relieved and looked down at my friend Corey, the uncoordinated one and said a prayer. From the top, I could stare back down at the ice and valley that we crossed. It was marvelous. And doubly so because of the effort it took to get up. Back down below, Corey tied in and began his ascent. With the encouragement of Jess below, he slowly but surely made it up, but not without a few slips and desperate hugging to the wall face. Even though you are tied in and there is very little extra slack on the line, it’s still not a minor task to get over that fear of slipping. But that’s a big part of the fun and what gives you the adrenaline rush. You can clearly see the rope in front of you, but below, it’s just the empty space separating you from the ground. In the moment, you don’t fully associate with the fact that you are secured. For me, that feeling motivates me to make each move as carefully as possible and not rely on the top rope. And it’s a wonderfully cold rush. After Corey’s ascent, I climbed back over and descended down the wall. Like normal rock climbing, you lean back and plant your feet our 90 degrees to the ground and using it to stabilize yourself against the wall as you are lowered. Once down, I stayed tied in and started right back up. We took turns doing this for the next couple of hours. With two different ropes tied in, we were able to switch between two separate routes up. When we finished, I asked Marius to do a few climbs so I can take some photographs. 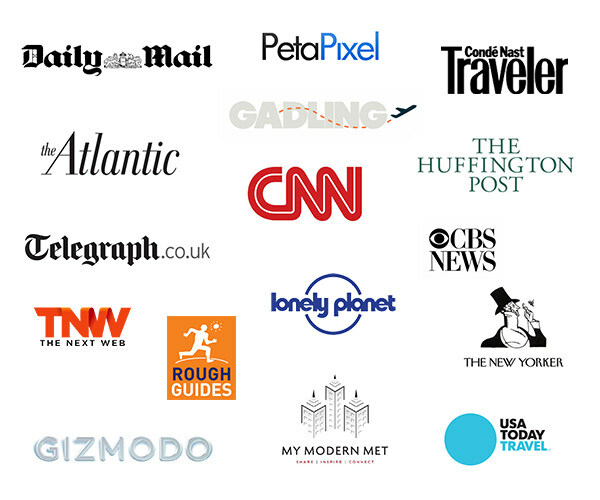 Once more, you can see how experience separates the pros from the beginners. While I grunted and heaved as I smashed the axe into the ice and kicked with the force of a excited donkey into the ice to ensure that I was secured, Marius simply looked like he was walking straight up the wall. It was humbling. After Marius’ display of “How To Climb Properly 101”, we began our descent back down feeling some of the soreness that would surely be in our legs and arms when we wake up the next day. But that also came with a huge sense of accomplishment. With the tips given after each climb, I definitely felt a huge improvement between my first and last climb of the day. I felt more confident that my crampon would hold against the ice and had a better sense for when it wouldn’t. I swung my axe with with more acceleration but required less power and in a more relaxed way. My step up increments and foot placement also felt more comfortable which allowed me to stand “on” the ice with having to tense my legs up. In short, it was a great introduction to the sport of ice climbing. Halfway back, we stopped by one of the crevasses in the ice for one more climb. 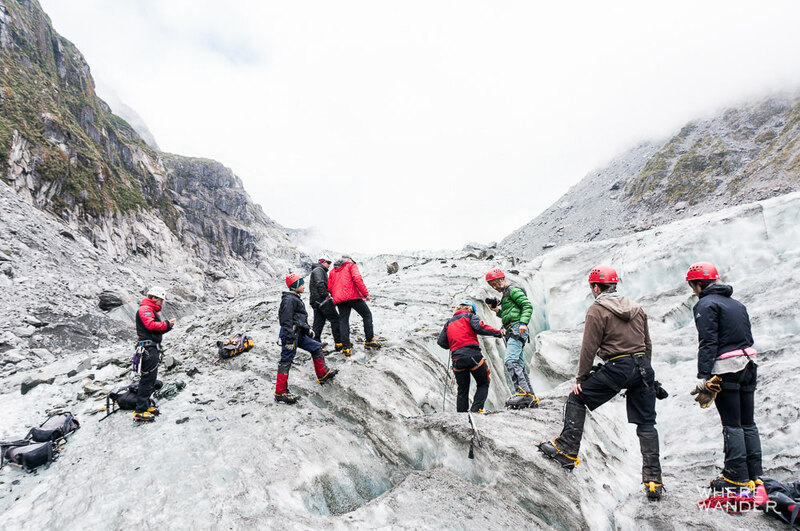 Marius explained that shaft was called a “moulin” and funneled water from the top of the glacier down through the hole and exiting somewhere by the base. Effectively, it was like a frozen blue well with running water. I was lowered roughly 25 feet down where I began my ascent. With the first kick and flick, I immediately understood why Marius didn’t lower me all the way. The ice was so much more dense than what we had been climbing on all day. I had to kick several times as hard as I could just to create enough of a crack in the eye to rest my crampons on. The same went for getting the axe into the ice. No longer could I afford the same efficient steps. This would take forever and I did not want to be pulled out. I had to reach as far up as I could each time. Summoning every last bit of energy I had, I exhausted my arms and legs to crawl my way up and out. And that was the cherry on top of the meat pie. I was relieved, but I think Marius was probably more relieved that he didn’t have to pull me out. We high-fived. Back at the office, I was tired and ready for an ice cream. I looked forward to a hot meal and a good sleep. It was that good type of tired. The type that reminds every so often you it’s all worth it because you got to do something amazing. I want to give a special thanks to Marius and Jess for the amazing experience and keeping us safe and Jo for helping to arrange the climb and allowing my friend and I to take photos from some pretty precarious positions. 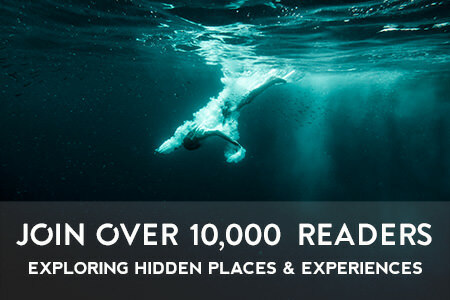 Check out their site and look them up if you’re traveling through the South Island in New Zealand. As tough as I made it sound, there is no experience required to do this, although being in decent shape certainly helps. 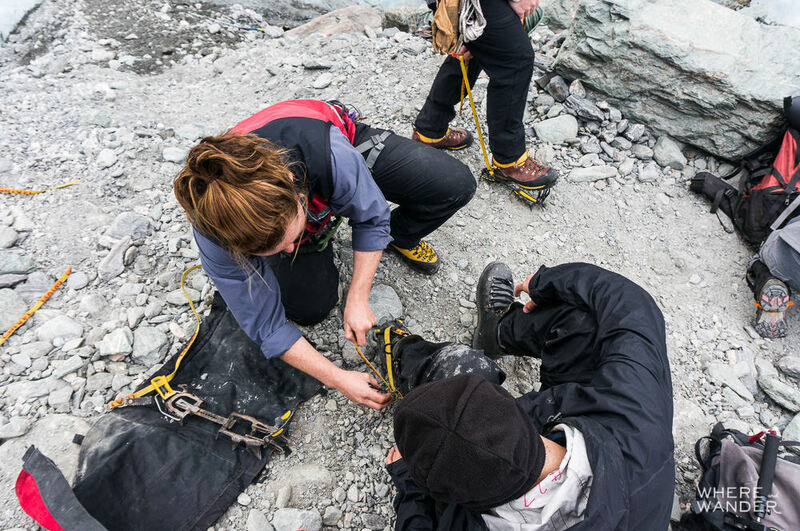 The guides will gauge your skill and comfort level and help you go as far as you can. 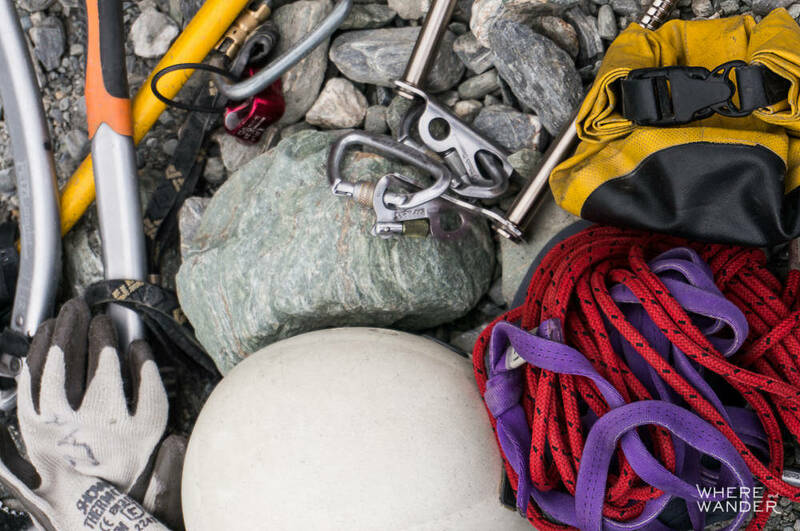 There is a max of 4 climbers to a guide, so you’ll get plenty of attention during your climb and enough time in between to recover for the next ascent.